Prof. Massimo Lopes wonthe WBW (Wilhelm Bernhard Workshop) Young investigator award 2017. He gave the award lecture "Replication fork remodeling: a double-edged sword in genome stability and cancer therapy"
on 22th June at WBW in Nizhny Novgorod, Russia. 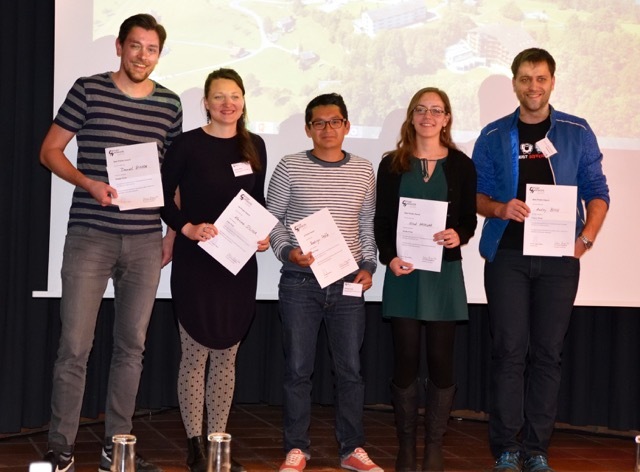 Hind Haswah won a poster prize at the 7th Cancer Network Zurich Retreat (March 26 - 28, 2017) in Emmetten, Switzerland. "Eosinophils function in experimental H. pylori infection" at the World Immune Regulation Meeting (WIRM) in Davos. Anna Stelling received the Charles Rodolphe Brupbacher Young Investigator Award 2017. Prof. Petr Cejka received the Friedrich Miescher Award 2017. Prof. Petr Cejka was awarded the Ernst Th. Jucker Prize 2015. Hella Bolck was awarded the Charles Rodolphe Brupbacher Young Investigator Prize. Prof. Massimo Lopes was awarded the Götz Prize 2013. Prof. Massimo Lopes received the 2012 EMBO Young Investigator Award. Prof. Anne Müller was awarded the Götz Prize 2012. Prof. Josef Jiricny was awarded the Ernst Th. Jucker Prize 2010. Prof. Alessandro Sartori was awarded the Ernst Th. Jucker Prize 2008. Dr. Massimo Lopes was awarded the Ernst Th. Jucker Prize 2006.
for outstanding work in the field of natural sciences. for his contribution to cancer research. Prof. Josef Jiricny was awarded the Swiss Bridge Award. Prof. Josef Jiricny was awarded the Gregor Mendel Medal of the Czech Academy of Sciences. Prof. Josef Jiricny received the Bonizzi-Theler Chair of Functional Genomics of Swiss Institute of Technology (ETH).